Cook spaghetti as directed on package. Drain. Meanwhile, heat 1 tablespoon of the oil in wok or 12-inch skillet over medium-high heat until hot. Add chicken; cook and stir 4 to 6 minutes or until chicken is no longer pink in center. Remove chicken from skillet; place on plate and cover to keep warm. Add remaining tablespoon oil to wok. Add carrot; cook and stir 2 minutes. 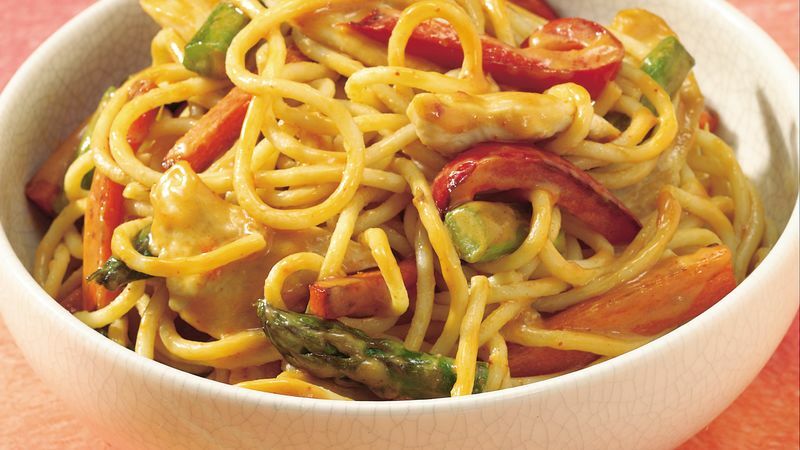 Add bell pepper and asparagus; cook and stir an additional 2 to 3 minutes or until vegetables are tender. Add cooked spaghetti and peanut sauce. Return chicken to wok; toss to coat. Cook and stir about 2 minutes or until thoroughly heated. There are many new peanut sauces on the market. Find the one you enjoy most and keep it on hand for quick meals. Try making this noodle dish with shrimp or 1/2-inch cubes of firm tofu instead of the chicken breast strips. For extra peanut flavor and crunch, sprinkle the finished dish with roasted or salted peanuts.